Avoid getting debris into the service liquid line which can plug the strainer, solenoid valve and flow control orifice. This might include loose rust or metal filings. Inspect more frequently when the supply water is hard or dirty. Repair or replace solenoid valve immediately if it is observed to be occasionally sticking. In recirculation systems, keep the tank and water clean by changing the water periodically, and keep the flow control orifice in the recirculation hose unplugged. Check service liquid flow to the pump immediately if the system doesnʼt come up to vacuum when the pump starts, or if there is a loss of vacuum during operation. Preventing Scale Buildup: Scale buildup is responsible for shortened seal life, reduced capacity and vibration. In hard water areas, use of a water softener is desirable; otherwise, descaling acid can be used periodically without hurting the Lyco pump, since it is made from stainless steel. Check the pump every two weeks after installation to get a feel for how fast scale builds up. This will determine how frequently descaling acid should be used. Check by looking inside the exhaust port for buildup. With a recirculation system, check the clearness of the recirculation hose. One cup of descaling acid can be put into the pump along with service liquid water, and be allowed to stand while the pump is off between runs. The acid can be sucked into the pump through the service liquid recirculation inlet in the front of the pump just before it is shut off, see “Piping Connections”. If a recirculation tank is used, descaling acid can be mixed with the water in the tank either manually or with a dispenser. Seals: Normal shaft seal life with clean, scale free operation is estimated to range from one to five years depending on how continuous and severe the duty is. The most common causes for shortened seal life are pumps running dry and scale buildup. Another cause might be incompatibility of seal materials with chemicals in the vacuum process. Standard materials used in shaft seal (Buna N), O-rings (Buna N), gaskets (Neoprene) and body seals (Noryl) are compatible with most chemicals. For others, a wide variety of optional materials are available from Lyco. The pump will continue to produce vacuum with a leaking shaft seal, so a leak will not be noticed until the leak is physically observed dripping from between the back of the pump and the front of the motor or bearing housing. A leaking shaft seal should be replaced as soon as possible, since service liquid can eventually work back along the shaft, around the slinger and bearing seal, flush out the bearing grease and cause a bearing failure. If a leaking seal can not be replaced immediately, and if the pump is a pedestal Model 501& 502, bearing grease can be replaced to prevent a failure. This is not possible with closecoupled, Models 101 & 102, which have motors with sealed bearings. 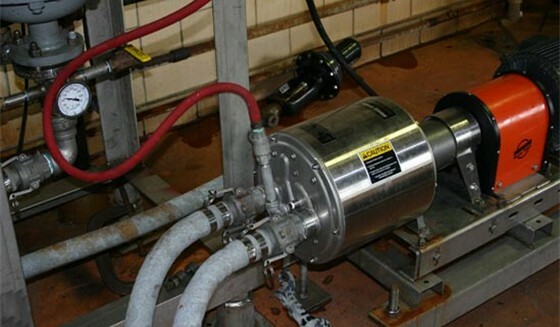 Lyco vacuum pumps have only one shaft seal, and it is easy to replace if the procedures described in the section “Pump Disassembly and Shaft Removal” are followed. Avoiding Exhaust Back Pressure: Back pressure can severely stress pump components and motors, and must be avoided. Refer to section “Exhaust Piping”. Avoiding Cavitation and Slugging: Cavitation and slugging can severely stress the pump components and motors, and must be avoided. Refer to section “Vacuum Piping”. Close-coupled pumps, Models 101 & 102: Current close-coupled pump motors do not require greasing because they have sealed bearings. Lubricate bearing housing while warm with power off. Use Mobil Polyrex-EM, Mobilith SHC100, Chevron SRI No. 2, or equivalent. Insure grease fitting is clean and free from dirt. Remove the relief hole plug which is located at the front side of the bearing housing. Clean out any hardened grease that might plug up the hole. Use a low pressure grease gun, and pump in recommended grease until new grease appears at the relief hole. BEWARE OF OVER GREASING. Applications in dusty, wet and high ambient atmospheres may require greasing as often as every 3-4 months; however, DONʼT OVER GREASE by greasing too often. Note that the rear bearing (away from the shaft extension) is a sealed bearing which requires no lubrication. When pumps and motor are in storage for extended periods of time, manually turning the shafts every six months will prevent bearing lubricants from hardening which can cause bearings to fail shortly after being put in service.